In today’s post I’d like to show you all the colors available in the standard line of inks from the famous Rohrer & Klingner as well as their Dokumentus line which adheres to the ISO 12757-2 standard which means they are certified , resistant to ethanol, hydrochloric acid, ammonia, bleach , water (obviously), erasure and are lightfast. There’s also another standard, ISO 14145-2 which some other manufacturers use like Montblanc. First things first, I’d like to talk a little bit about the creation process of these swatches since I plan to upload all of my ink collection as I have the time. Each swatch is made by dipping a cotton swab into the ink and drawing lines on the ink card. This is repeated when I reach halfway through for the ink color to remain saturated (it’s clearly visible on the Rohrer & Klingner Verdigris swatch). Some inks don’t require this though, these inks I feel are really well lubricated and are nicely saturated throughout the swabbing. The inks that exhibit behavior are usually the ones which don’t offer shading. After this is done, I let it dry and then using a dip pen I write down the manufacturer and name of the ink as well as the required www.pennonia.eu “watermark”. Creating these swatches as it turns out takes a lot of time! The paper I used is a pure white, textured 180g card from my own Tintenbuchs. I created these specifically because I have a huge collection of inks (100+) and this is a great way for me to keep tabs on what each color in my collection looks like. An important note I would like to highlight is that I use a color calibrated display to adjust the color of the scans to match the real life color of the ink as closely as possible when viewed in a sunlit room. Here are some technically details: The scanner I used is a Brother DCP-L2532W multifunctional printer. Each card is scanned at 600 DPI and edited in Affinity Photo. The monitor I’m using is a DELL P2416D which covers the sRGB color range completely. For calibration I’m using a Spyder4PRO colorimeter. This of course doesn’t mean what I see is what you’ll see but this does provide something for those people who also have a color calibrated display. 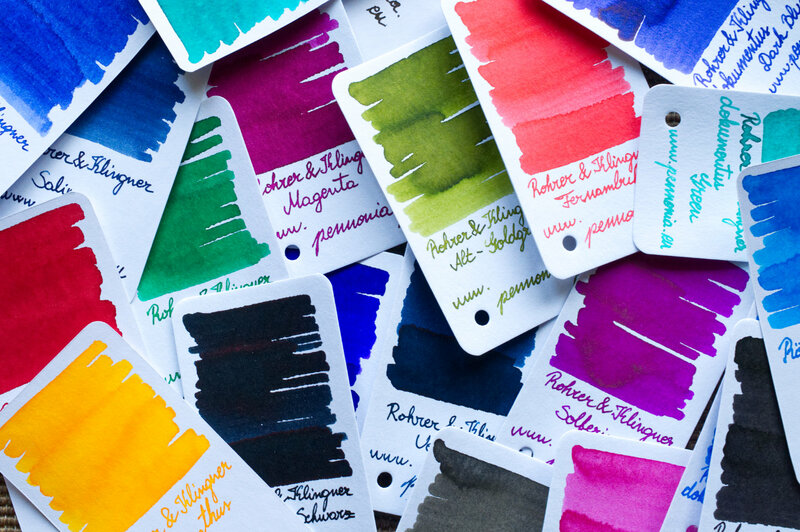 You can check out all the inks from Rohrer & Klingner on our shop at this link. I’d love to hear your opinions on these inks! Which is the best color? Are they better or worse than other inks from different brands? Why do you love or hate a color?